Reflecting realism and grasping the beauty of life provided the fountainhead of my art. In China I seek source material and inspiration from daily life. In America I follow the same path, painting what I see and feel. Artistic creations are based on the re-creation of life’s experience. By being truthful to oneself, love will give birth to life. Zhu Ping (b. 1943) was born in Harlbin, Northeastern China in October of 1943. At age sixteen she was accepted into the auxiliary high school and college of the Lu Shun Art Institute. In her eight years of study from 1958 until 1966 she established her basic skills with a solid foundation in creating art forms and techniques. After a period of six years of work as an independent artist, Zhu Ping joined the staff of the Art Department of North-Eastern University. She was to spend twenty years on staff, rising to the rank of Professor. Zhu Ping believes that her twenty years at North-Eastern University marked her most fertile period of creativity as an artist. A number of her paintings were acquired by museums in China; she also won the highest award from the government of Ji Lin province and a bronze medal from China’s National Art Exhibition. In 1991 professors Ed Shay and Robert Paulson visited North-Eastern University where they met Zhu Ping. After seeing her work they invited her to come to Southern Illinois University as a lecturer for the 1992-93 academic year. She then moved to Chicago where she spent the next six years. During this period she had numerous one-woman shows, she participated in a show of U.S. based female Chinese artists which was hung at the Palette and Chisel Club, was included in an International Exhibition in New York City and she was commissioned to paint the portrait of Jim Edgar, the Governor of Illinois. 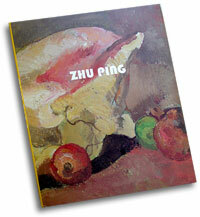 Residing in Los Angeles since 1998, Zhu Ping has continued to refine her skills. She favors strong colors and she finds resonance in the abstract art of Paul Klee and Joan Miro, the elegant colors of Odilon Redon and the color simplicity and structural formality of Edouard Vuillard. Reflecting realism and grasping the beauty of life provided the fountainhead of my art. In China I seek source material and inspiration from daily life. In America I follow the same path, painting what I see and feel. Artistic creations are based on the re-creation of life’s experience. By being truthful to oneself, love will give birth to life.